He stands but five foot and two inches tall, and yet his name is large in the minds of millions of fans the world over. When he puts on his schoolboy uniform for a live performance, he becomes gigantic. Nothing short of a whirling dervish, a tornado of energy, physical movement, and very loud and blunt guitar playing, he is Angus Young. A massive figure in the history of rock and roll music, Angus Young is the frontman of AC/DC. The usual manner of things is the lead singer is the face of a band. With AC/DC, this is not the case at all, as the band has, sadly, had to replace singers, but there could never be an AC/DC without Angus Young. Rolling Stone magazine ranks Angus Young as the twenty fourth greatest guitarist of all time. He has a net worth of over one hundred and forty million dollars, and is a member of the Rock and Roll Hall of Fame. A truly fantastic entertainer, as he does his own version of the Chuck Berry duck walk across the stage, he's almost exclusively got a Gibson SG guitar in his hands. Angus Young with one of his custom made SGs, you can see this from the lightening bolt inlays on the fretboard. Angus Young has stated he prefers the SG over the Les Paul for the very simple reason that the Les Paul weighs too dang much. I'm not a large man myself, but I'm quite a lot larger than Angus, and I would also feel that standing and playing the Les Paul for a two hour show would leave me sore in the shoulder. The Gibson SG is a far lighter weight guitar than the Les Paul, and are those devil horns, or angel wings on the thing anyway? 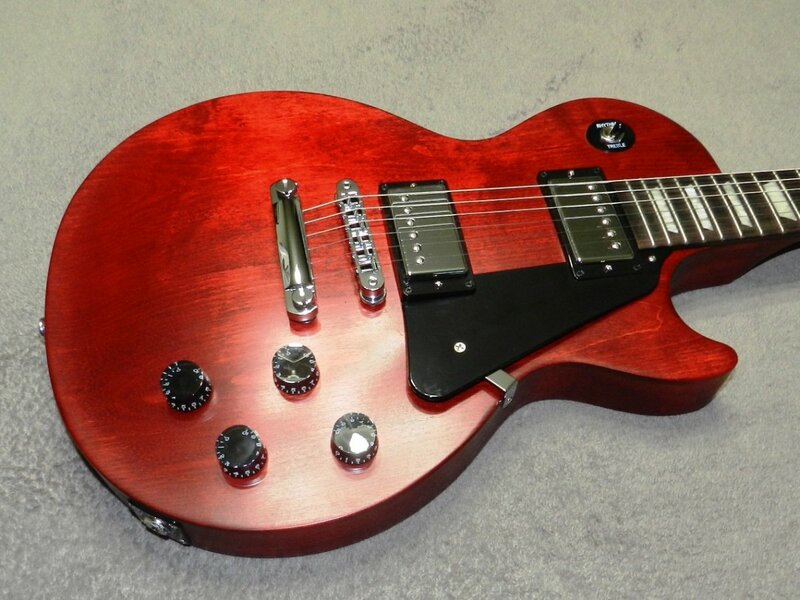 I'm going for angel wings, as the Gibson SG is extremely affordable when compared to something like a Les Paul Standard. What other benefits does an SG offer besides being lighter in weight, and more affordable? Well, you can, with a double cutaway guitar, have much easier access to the upper frets than you get with a single cutaway guitar. So with the SG you can get your hands to all the frets furthest up the neck with more ease. What about sound? Sound matters a lot to all of us guitar gear heads and tone chasers. What sounds best is generally what you'd think of as a subjective thing. No one can really say a flavor of ice cream is better than another, and the same is true with guitars and their respective sounds. If the two Gibsons were dogs, the SG could be said to have more bark, the LP more growl. Angus Young has several SG guitars. He still has and plays his very first one, which he owned prior to the existence of AC/DC. For years this guitar's date of origin was a bit of a mystery. Knowing the information wasn't something important to Young. In recent years Gibson's website states the guitar is a 1968 SG. It must also be mentioned here that Angus Young also owns and plays Jaydee custom SG guitars, which are modeled entirely off of Gibson's own original design. So far as Angus Young and his relationship with Gibson, to date there have been two distinct Angus Young model Gibson SGs put into production. We're going to take a close look at them here. Following this we will explore some history of the life of Angus and the band AC/DC. Both Gibson Angus Young SGs are modeled after the exact same guitar. So why is it they look different? Angus, after some years of playing the guitar with the vibrola tailpiece, simply decided to have it removed. He had the more common Gibson stop-bar tailpiece installed to replace the vibrola. Why would he do that? Well, although Angus did use the vibrola from time to time, he apparently decided he didn't use it enough to warrant keeping it on his number one guitar. The end result is if you are a vibrola lover, and want an Angus SG, there are the first Angus guitars out there for sale, and if you aren't a vibrola user, the second model is out there for sale. The lyre vibrola is a very attractive piece of hardware. It is clearly a very old school piece of equipment, and a lot of the earliest SGs had them. All this begs the question, what's wrong with them? Well, as time has gone on, trem systems have been greatly improved. The lyre vibrola isn't so able to be used without knocking the guitar out of tune, as more modern trem systems are. On the Gibson Angus Young SGs featuring the lyre vibrola, the vibrola is aged so as to appear to be very used, just like the one which used to be on Angus's own guitar, and also is engraved with the Angus. Angus Young, as has been mentioned, is a physically small person. So it isn't surprising that his hands are also smaller than normal. What does this have to do with anything? The necks on the Angus Young model guitars are of a lesser width than any others you're likely to run into. Gibson's website describes these necks as its narrowest. For this reason I feel it is extremely important someone play these guitars before purchasing. 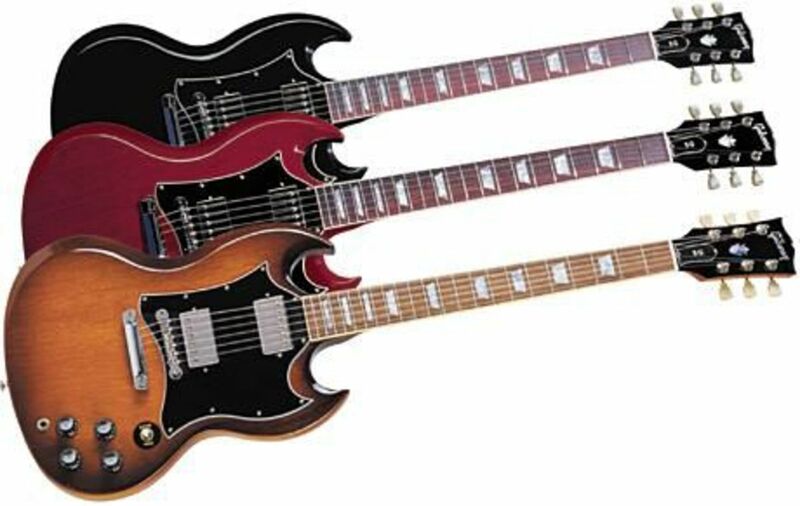 If your hands are average sized, or larger than average, you may very well want a Gibson SG, just not the Angus Young model SG. All of these guitars are used. I'm spying them for sale online for between two thousand dollars, and seven thousand five hundred dollars. I can see no reason why a mint one would be worth so much more than one which has been played in a bit. 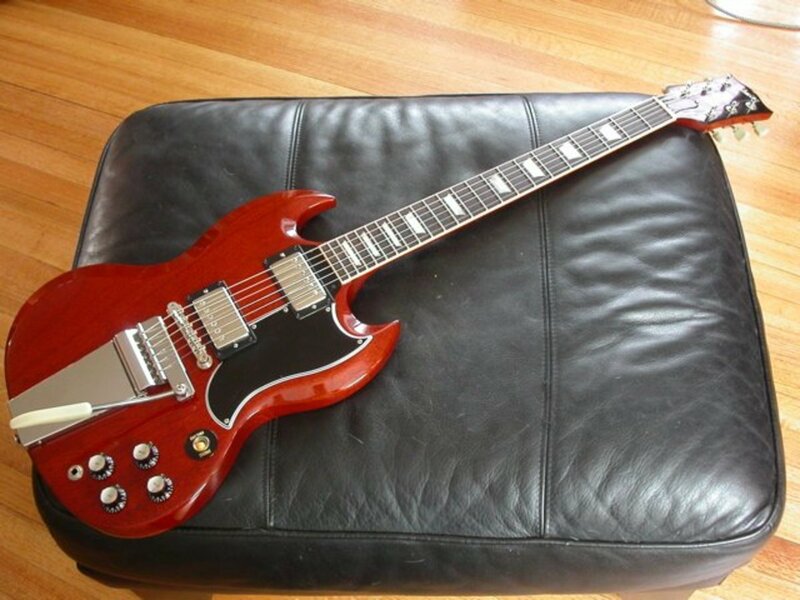 The newer Gibson Angus Young SG is modeled after the exact same 1968 SG owned by Angus Young. The big visual differences here are the lyre vibrato isn't present, and then there are the lightening bolt inlays for fretboard positioning markers. There are more structural differences though. The neck is the same profile, the narrowest of all Gibson necks. Again, I have to say that if your hands are above average size, or if your fingers are, perhaps, more wide around the tips, then this neck may just be too narrow for you to play your best with. Only you can say for certain whether this neck is okay for you, or not. The neck of this guitar, unlike the previous one, is of maple. The previous guitar was of a much more traditional mahogany. What's the difference? Maple is thought to be a stronger wood, as it is definitely a denser wood. What else about that fingerboard? Some of these guitars have rosewood fingerboards, and others have ebony fingerboards. I honestly don't know of people who dislike rosewood fingerboards. What I know myself is, I very much prefer an ebony fingerboard, and I feel the difference with my fingertips whenever I get to play on one. Take a close gander at the head-stocks of either Angus Young guitar and you see a custom emblem. These are a bit of a devil emblem, or perhaps an imp. It reminds one of what is also seen on any of the Gibson Slash Les Paul models, and is a highly personal touch. What about the pickups? Both Angus Young SGs come with the same pickups, there is a Gibson '57 Classic in the rhythm or neck position, and a Gibson Angus Young pickup in the bridge. These are quite different pickups. The Gibson '57 Classic is in every way meant to be a classic Gibson PAF humbucker. It's one of their best pickups, and used on most of their best Les Paul model guitars. The style is an Alnico II, which is low output, passive, and great for classic rock, blues, jazz, and even metal music. The Angus Young humbucker? This pickup uses an Alnico V magnet, and is a much more high output humbucker. What do I mean by high output? I mean this pup will get you a lot more crunch, and is meant to be much more of a metal guitarist's humbucker. The Gibson SG is always a leaner and meaner rock and roll machine than the Les Paul. Almost every SG model costs less, and has a more aggressive look to it. Never forget the SG weighs a lot less. If you stand and play live, you will absolutely appreciate this. Gibson Angus Young SGs are not especially common guitars. You're honestly not likely to run into one, and get to play one unless you go to a guitar show in a major city, and happen to find one there. If you shop for one, online is just about the only place you will find a specimen. I've always felt more comfortable playing a Gibson SG than a Les Paul. The thinner and lighter body is just easier to handle, whether you are playing seated or standing. I'm no shredder, but I very much appreciate the increased access to the upper register of frets the double cut-away design affords the player. I'm not a heavy metal player, but the SG can certainly produce that tonal profile. I have always felt the SG is more versatile than commonly realized. 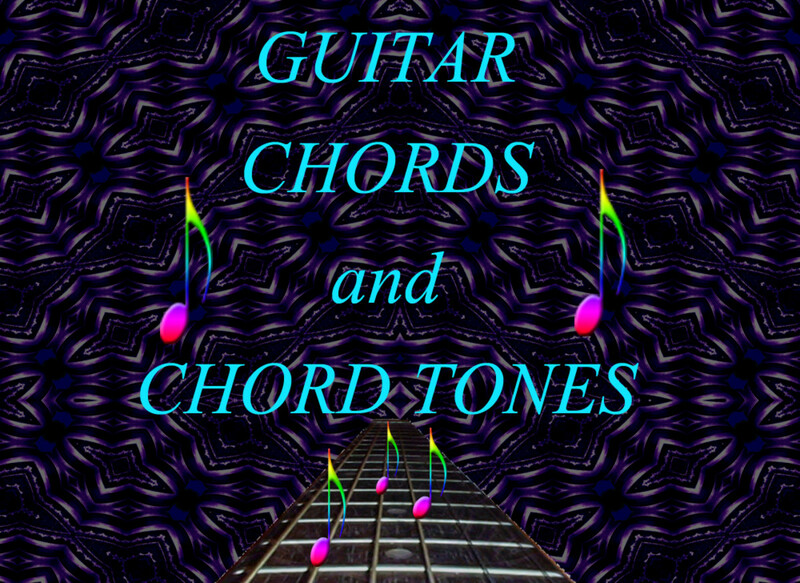 It can produce some wonderful country and blues tones. I'm an average sized guy, and I've always felt Gibson necks felt wonderful. Unless you've played standard Gibson necks, and felt they were too big for you, then you simply do not want to go for a thinner neck, like what Angus Young uses. So unless you are a smaller sized man or woman, I will always recommend the SG Standard over the Angus Young SGs. Gibson 490 rhythm and treble pickups are loved all over the world. These pickups are more geared towards rock music than the equally loved '57 Classics. These are in every way, a PAF pickup, the design which Gibson made known and coveted the world over. If you feel you have to have the same pickups Angus uses, hey, they're always for sale, and you can have them installed. All Gibson guitars are Plek'd now. This means high tech machinery is employed to ensure the set up is absolutely perfect. 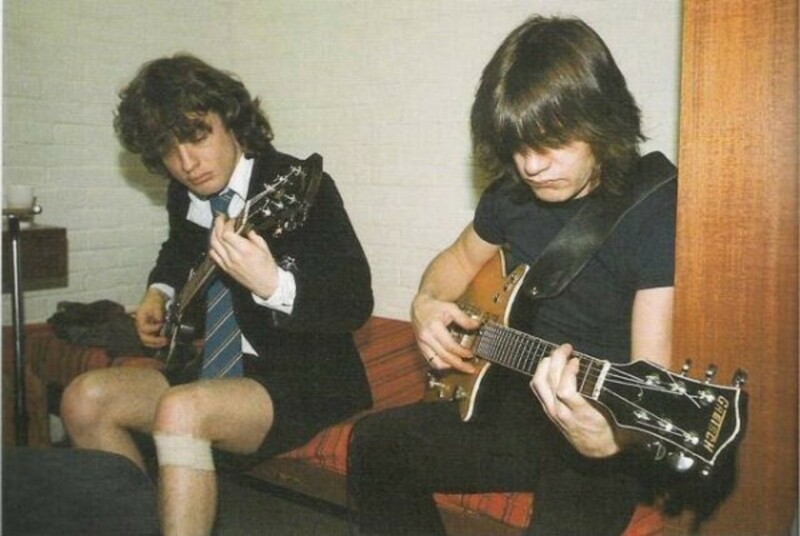 Brothers Angus and Malcolm Young. Angus Young is always associated with the great nation of Australia. The fact of the matter, however, is he was born in Glasgow, Scotland. Fifteen members of the Young family left Scotland for Australia in the year of 1963. The Young family was an extremely musical family, and every male member played music in either a professional or amateur capacity. Older brother George Young had been a successful guitarist as a member of The Easybeats. Angus would drop out of school at the age of 15. He seemed to know already his life would be that of a musician. Originally playing a banjo set up for six strings, he would soon get a cheap second hand guitar, and in 1970, his first Gibson SG. He played the SG until the neck warped. Angus, Malcolm, and George would soon band together, and they recorded an album. The music, however, was nothing like what was to come. Sister Margaret Young had a sewing machine, and on the back was the inscription AC/DC. Sounded like a fine name for a band to Angus and Malcolm. They knew what it meant, it meant electricity, and despite hysterical Christian conspiracy theories in the years to come, electricity, energy, and power were all it would truly mean to the boys. AC/DC was formed by Angus and Malcolm, the rest of the band would wind up being replaced. They wanted something much more rowdy and loud. Angus was working on a stage costume. He tried several different things, then sister Margaret, the one with the sewing machine, would use the thing to make Angus a school boy's uniform. 1975 saw their debut album, a big hit in Australia, High Voltage. The next several albums were minor hits. The band was definitely cementing itself in the public's mind as a good times, bad boys power rock band. Bon Scott had a voice like no one else in this world, and he had a stage presence and a flair for showmanship that matched that of Angus Young. But for Bon Scott, his stage act was no act, he was merely being himself on stage. He was the genuine thing, the real deal, and sadly, he drank himself to death not long after the release of Highway to Hell. The album Highway to Hell meant a lot to me as a kid. You can be sure I listen to it now and again still. AC/DC would be evil in a very tongue in cheek sort of way, the same way everyone is evil. Really, it's just a fun album to listen to. Richard Ramirez, the serial killer known as 'The Night Stalker,' however, had apparently been a fan of the band. He left an AC/DC baseball style cap at the scene of one of his murders. The investigating police felt the hat was a clue. AC/DC would be thought to be linked, somehow, to a serial killer in the United States. The song Night Prowler, on the Highway to Hell album, suddenly sounded very ominous. A travelling preacher showed up at the church I attended as a child. The preacher had a huge list of things to talk about, and all of them had to do with how Satan controls popular music, luring all spiritually unsound persons to a life of sin. AC/DC was very much a part of his sermons. It caused me to love the Highway to Hell album even more. With the death of Bon Scott, the boys in the band had to have wondered if there were any moving forward to be done. Scott was a once in a lifetime sort of vocalist. It isn't possible to sound like Bon Scott, and even if it were, one wouldn't be Bon Scott, whose antics on stage were as much a part of his unique personality as his voice was. Bon Scott's parents told the band they wanted them to continue making music, and that Bon would have wanted them to continue making music. The band met with Brian Johnson, an Englishman, and realized they had found someone who could manage Bon Scott's vocals, in his own way, and also provide something very unique himself. Back in Black was recorded and released as a proper send off, or tribute to the late Bon Scott, but it also ushered in the age of Brian Johnson, and AC/DC would become an internationally successful band. Back in Black sold fifty million copies. It is one of the single most successful albums in all of history, and no collection is complete without it. The hits are permanent staples of classic rock radio. The title track, and You Shook Me All Night Long would become staples of my youth. The radio was always on wherever I was. AC/DC would go on a year long world tour to support the album, and they'd cement themselves as a top selling attraction for the entire decade of the 1980s. Some critics weren't so impressed, and complaints were the album represented hyper masculine fantasies, rock music stock phrases, garish guitar, and dull rhythms. Critics don't sell records, but AC/DC does. Macho hedonism has always sold records. Lets not forget this is blues based rock music, and the blues is full of the exact same things. Working class laborers get off work, they want to have a drink, and release their inner demons through shouting along with AC/DC songs. That's what I always did, and though I'm not a blue collar laborer at present, I still get my ya yas out in the same ways I always did. Well the hits just kept coming, but the band would never again reach the pinnacle of success they'd had with Back in Black. There'd be a resurgence for the band in the 90s with The Razor's Edge, and things would continue on for a while just so until the tragedies of age hit. They hit AC/DC, Angus is the same as he ever was, just older. Let there be rock? 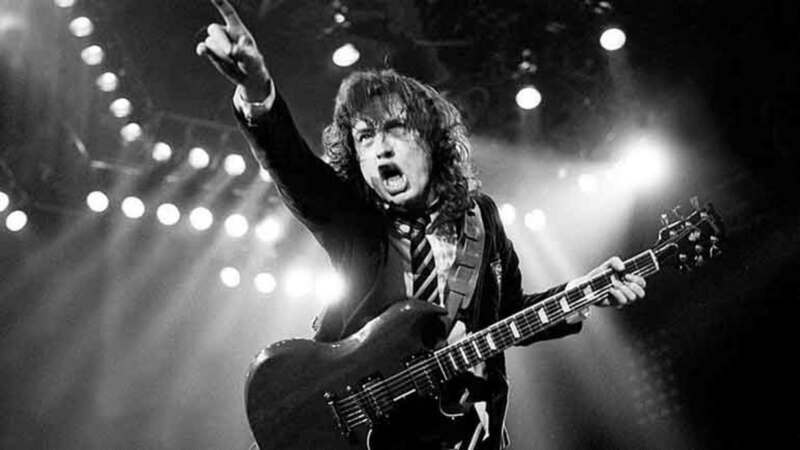 Yes, Let there be rock, but there must also be Angus Young for it to happen as it should. Thanks for reading. 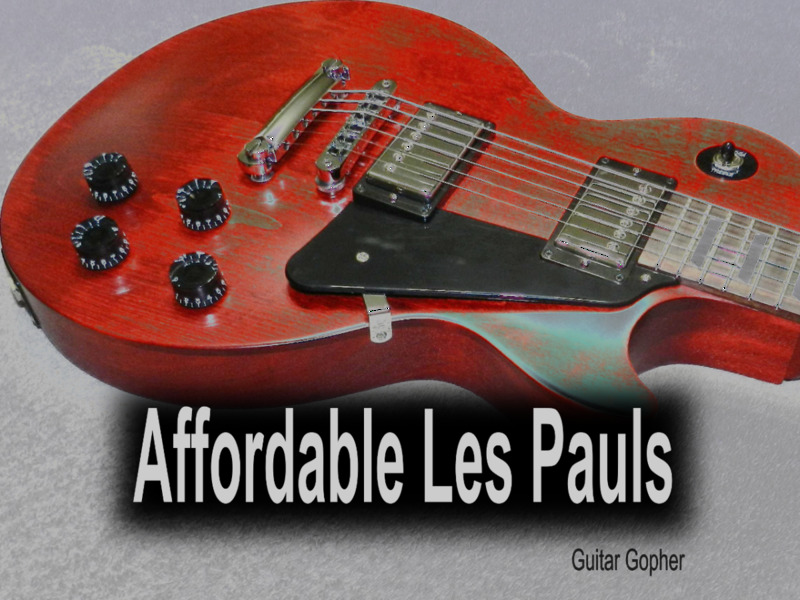 Gibson SG vs. Les Paul: What's the Difference and Which is Better? 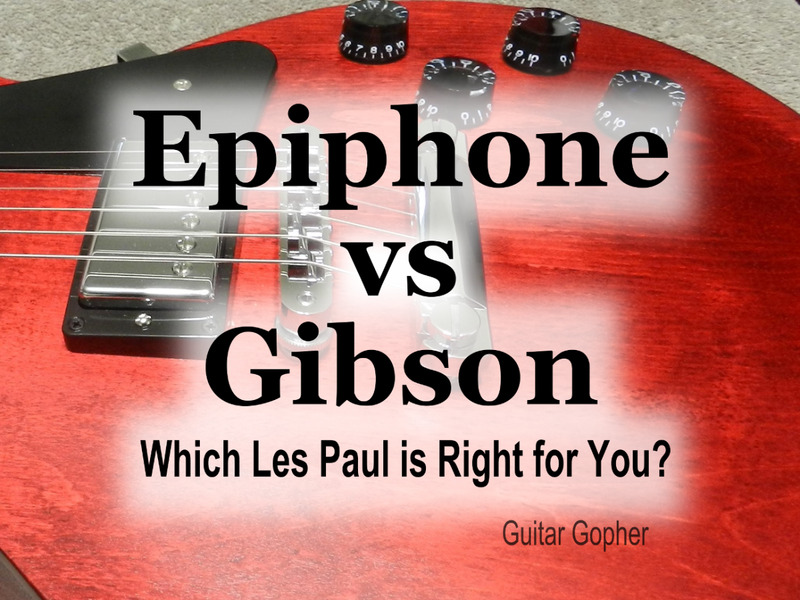 Is Epiphone the Best Alternative to the Gibson Les Paul? Thanks Sherry. I try to be scholarly about it, but I'm just an undergrad compared to some folks I see 'out there' on the web. Yeah, when someone is out of their gourd they can spot devils in the clouds, even. The name I heard back in the day was "against Christ, devil's children," such nonsense! Quality beats quantity by miles. That sounds like a good plan. I have been working on a new article for a while now. Mine tend to be longer. I marvel at some hub writers who can churn out articles on a regular basis, some even daily, but relatively short. If only I had a little more time. Thanks Liz. Seeing as how I can submit one article every two weeks - I've decided to spend exactly two weeks on every new article. I think a lot about what NOT to put into something. I used to do 5 thousand word articles, but I think that is too long now. 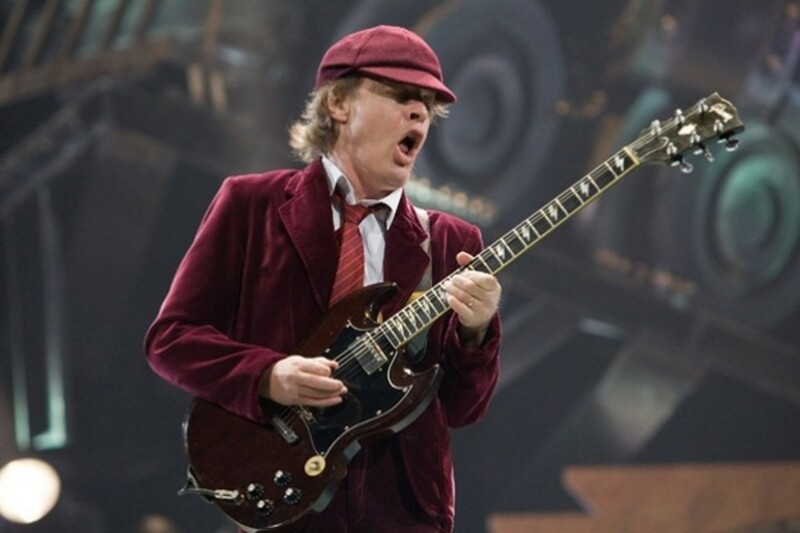 This is a great article, dealing with Angus Young and his chosen guitar. There was a lot of that going on in the 1980s. Christian conspiracy theories about 'devil worship' with the musicians. It was all pretty silly. These days there are bands who pretend to be satanic simply because that's part of the heritage of rock or metal music. For the most part, I only ever play guitar to please myself. I've played in front of large crowds a couple times, but it was sure a burden on me to do it. I would be shaking in my shoes and sweating bullets thinking about it, but it turned out alright every time. You knowledge concerning guitars is obviously lightyears ahead of mine. However, I found this to be an interesting article. I have a son who plays just for personal entertainment, but it is fun to hear him play. As far as the devil and rock band names, I think it is just an attention getting name that will be remembered. As I believe you know, I am a Christian, and no rock band would change my views. I either enjoy the music, or not! Hey Mr. Happy! I'm happy to have a visit from ya. There was a rumor that AC/DC meant bisexuality. I watched a lot of Angus Young interviews on Youtube to prepare to write this, and he seemed pretty disgusted with that one. What a joke. Well, you know, I'm a Christian. Not an especially church going one, I go about twice a year, to make the mom happy - sitting next to her. Christians are good at spotting devils everywhere. Of course these devils are generally just in someone's head. I do believe in devils and all that, you know, but if Satan is responsible for making my rock music so much fun, well, I guess he deserves thanks for that. Guitar nuts are sometimes WAY into all the technical details of specifications. Of course I'm very into that stuff, myself, but I constantly run into people who can blow my puny knowledge completely out of the water. "Nothing short of a whirling dervish, a tornado of energy" - Haha!! Ya man, for sure! I am so glad I got to watch them live, once. I just love AC/DC - they're #$%^ing awesome! Cool piece of writing! A lot of the technical stuff went way over my head as I am more, or less clueless about guitars but I am learning thanks to You. This piece of writing made me curious what guitar Jimmy Page used (one of my favorite rock guitarists) and what I found was a long list of guitars, not just one, or two lol It seems he also had Gibsons modified and sold with his name attached to them (Gibson Jimmy Page Signature Les Paul, Gibson Jimmy Page Signature EDS-1275). Alrighty, that's about it for my guitar lesson for now. Take care and all the best!